Dark teal bodywork with white, orange and black stripes. Black base and window frames, smoked windows, brown interior. Highly detailed coach in 'Shearings' fleet livery. 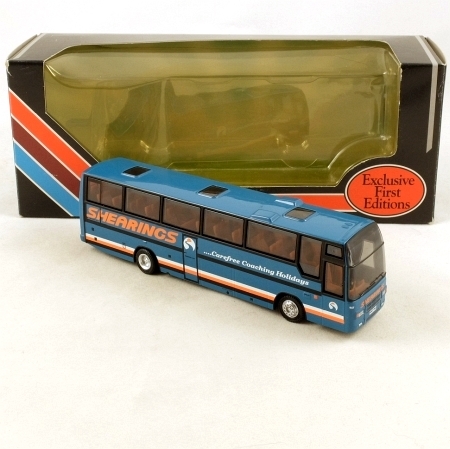 'Shearings' name and logo on the sides and front with 'Carefree Coaching Holidays' on the sides in white and orange. 'H957 DRJ' number plates. Silver wheels with black tyres, double at the rear. This model is in mint condition, and the box is good-to-excellent; the outer clear plastic part is slightly discoloured and there is a small split in the inner one.